Justin Dunn (left) and Jarred Kelenic became the Mariners' third- and second-ranked prospects, respectively. The Mariners' overhaul is about to take another huge step forward. In charge of one of two teams that entered the offseason without a top 100 prospect, general manager Jerry Dipoto first acquired highly touted left-hander Justus Sheffield from the Yankees for James Paxton. Now he traded eight-time All-Star Robinson Cano and closer Edwin Diaz to the Mets for No. 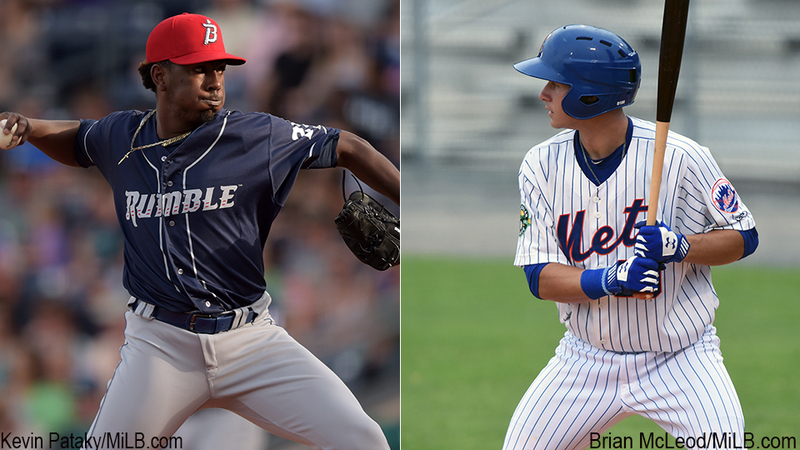 3 prospect Jarred Kelenic and fourth-ranked Justin Dunn, both of whom are ranked among MLB.com's top 100. The Mets also sent veteran outfielder/first baseman Jay Bruce, reliever Anthony Swarzak and right-hander Gerson Bautista, while the Mariners kick in at least $20 million. The trade was made official on Monday afternoon. "We view Kelenic as a true 5-tool player with a very high ceiling," Dipoto said in a released statement. "Dunn is another former 1st round Draft pick, who we think has a bright future on our pitching staff." Serious momentum toward a deal picked up Thursday and Friday, carrying into the weekend. In completing the trade, Mets general manager Brodie Van Wagenen sends a message that he believes the organization is in a position to win now, rather than waiting for Kelenic and Dunn to develop. With the arrival of Sheffield (Seattle's new top prospect), Kelenic and Dunn, the Mariners will have a new trio atop their rankings. Kelenic was the sixth overall choice in this year's Draft and was widely considered one of the best hitting prospects coming out of high school. The Mets were drawn to the outfielder's comprehensive skill set that includes an advanced approach at the plate and a 60-grade arm in the outfield. MLB.com's No. 62 overall prospect excelled in his pro debut in the Rookie-level Gulf Coast League, hitting .413/.451/.609 in 46 at-bats to earn a promotion to Rookie-level Kingsport. There, the Wisconsin native struggled initially with 10 hits in his first 68 at-bats. Kelenic eventually found his groove and hit .253 with a .781 OPS, five homers and 33 RBIs in 44 Appalachian League games. The Mets took Dunn with the 19th pick in the 2016 Draft out of Boston College. He posted a 5.00 ERA with Class A Advanced St. Lucie in 2017, his first full season in the Minors, and returned to the Florida State League this spring. The 23-year-old right-hander gave up 12 earned runs over 45 2/3 innings in nine starts before being promoted to Double-A Binghamton, where he was 6-5 with a 4.22 ERA in 15 starts (89 2/3 frames). Dunn is from Freeport, New York -- roughly 25 miles from Citi Field -- and was a reliever at BC until his junior season. His fastball sits in the 93-95 mph range and he also throws a slider, curveball and changeup. Evaluators have pegged the No. 89 overall prospect as a potential No. 3 or No. 4 starter in a Major League rotation. Cano, 36, is coming off a tumultuous season. Despite solid numbers -- a .303/.374/.471 slash line with 10 homers and 50 RBIs -- he was suspended 80 games after testing positive for a banned substance in June. He'd return to New York, where he starred for the Yankees from 2005-13. In Diaz, the Mets get a back end of the bullpen arm who led the American League in saves by a wide margin with a career-high 57 in 2018. After a strong 2017 campaign, Bruce endured an injury-riddled season that brought mediocre results as the 31-year-old batted .223/.310/.370 with nine homers and 37 RBIs in 94 games. Swarzak suffered an oblique injury during the first week of the season and ended up surrendering 18 earned runs over 26 1/3 innings in 29 relief appearances. Bautista made his big league debut in April but spent most of the year in the Minors. The 23-year-old was 4-1 with a 5.14 ERA in 37 relief appearances for Double-A Binghamton and Triple-A Las Vegas. He has a fastball that reaches triple digits and recorded 69 strikeouts over 49 innings across the two levels.